HD-tES allows targeted non-invasive electrical stimulation. Soterix Medical developed HD-tES as the first transcranial system capable of targeting the brain with weak electrical stimulation. HD-tES broke conventional thinking that only high-power magnetic or implanted electrodes could achieve focality. Soterix Medical has continued to innovate HD-tES by introducing Neurotargeting software for individualized programing, the first neuronavigation system for tES, and research-grade integration with EEG. 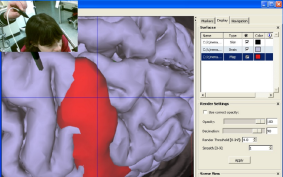 Soterix Medical HD-tES can be integrated with EEG from 8 to 64 channels. 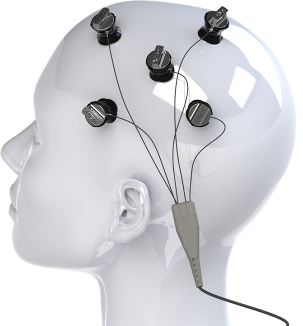 HD-tES is compatible with any research-grade EEG system allowing any Soterix Medical stimulator to be flexibly integrated with EEG systems. HD-tES can also be combined with Neuronavigation using the Soterix Medical Neural Navigator. 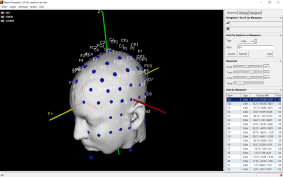 The Neural Navigator can be integrated with Neurotargeting software to design and deliver individually optimized stimulation. 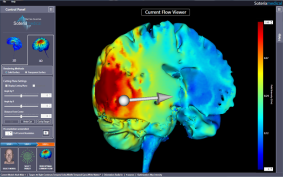 1) Use HD-Targets to determine optimal electrode placement for your brain target. 2) Load stimulation electrode voxel locations into Neural navigator software. 3) Navigate to stimulation electrode location using individual's MRI and mark location on scalp. From the trusted leader in non-invasive neuromodulation, Soterix Medical HD-tES has been validated in rigorous clinical trials. When stimulation tolerability and reproducibility cannot be compromised researcher and clinicians choose Soterix Medical stimulation systems. All products come with expert Soterix Medical technical Soterix Medical support, documentation, and training. HD-tDCS is the use of HD-tES with tDCS waveforms. The most powerful and flexible stimulation platform. Simple and economical for cortical targeting.